Guest Celebrity, Ollywood Actress, Ms. Archita Sahu. and expressed their gratitude to the brand for such an opportunity to represent the tradition of Odisha through couture. The brand also promoted artists of Odisha who had represented the state at an international platform, Ms. Padmalya Nanda, Little Miss Universe 2017 and Maitri Monali Pradhan, Miss Teen International Most Talented who was also KIIT Nanhipari 2016.
ever and hope people love it. 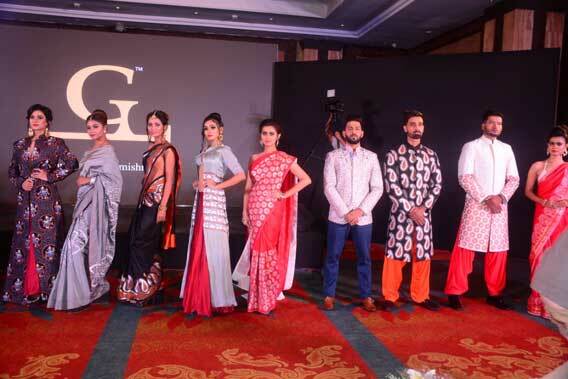 The new concept introduced at the ramp was loved by one and all and that was really overwhelming” said Dr. Kumar Guru Mishra, Designer, Brand “G”. 3. India Runway Week, Season 11, New Delhi (September 29th, 2018). He is the first Odia designer to do a premium solo show at Bangalore Fashion Week and also the first Odia to present his couture at India Runway Week, New Delhi. He also has selected Ollywood Actress Ms. Archita Sahu to be his showstopper at Bangalore Fashion Week to be held on 4th August, 2018. “The day I saw his collections I fell in love with all of it. Being a doctor, doing this stuff, I was amazed and wonder how he manages to do all this so brilliantly. I am going to be his showstopper at Bangalore Fashion Week and his collections for that show are just beautiful. I am really excited about the show. I wish him all the best in his future endeavors and keep on creating such beautiful couture.” said Ms. Archita Sahu, who was donning an attire from his collection – CHITRAA ASSEMBLAGE. “I am happy that this young generation from Odisha is doing such wonders. 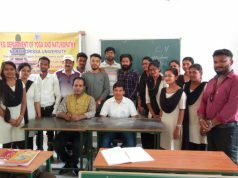 These people are the ones who can change the current scenario of Odisha and bring about a change in the society. I wish him all the best for his future and hope that he achieves many laurels in his life both in his medical and designing field” said Sri Tara Ranjan Patnaik, Chairman, Falcon Marine Exports Ltd.
guidance and support they can do wonders for Odisha. Dr. Mishra has proved there is nothing a man can’t do. If a person truly wants, he can achieve all the success in his life. I wish him a bright future ahead and wish he places Odisha in the global platform” said Smt. Jagi Mangat Panda, Managing Director, Ortel Communications. Dr. Mishra expressed his special gratitude to Sri Pankaj Kumar Sahu, his sisters and parents. “I am happy to see him grow. I have always said, he is that person, “Jiye bhiatru bi sajaye, ebang baharu bi sajaye”. The day I interacted with him, I knew he has a certain charm, a charisma and he will go miles. I wish him all the luck in the world and will keep on supporting him to see him achieve the greatest heights in the world of fashion.” said Sri Pankaj Kumar Sahu, Founder, Odstin Creations.